Anyone ever see this many TEMS controllers in one place? I went on a crazy buying spree to get these things. I have a plan for the smaller version. Will post up when I complete what I am doing. Nice collection. Are you planing on controlling each strut separately with all those controllers ? I'll have a couple spares though. is it plug and play ? They all will be when I am done. I'm going to use my tems buttons for my standalone boost control high boost and low boost. What's the bottom left one out of? The 2 smaller form factor units are Japan model TEMS controllers. 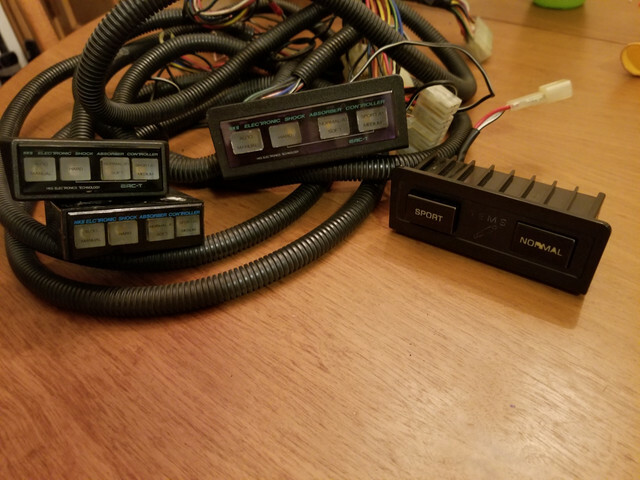 I have 1 "early" and 1 "late" model HKS controllers from the Soarer. There are very slight differences, but I am changing around the wiring to make them drop in compatible with the A70. Its tricky to find photos, but it would have normally mounted in front of the shifter on the Soarer model. I've seen the upper left Soarer one's before. Never the bottom left tho. Almost looks universal in that housing. It probably used to look like the other one. Whoever previously owned it cut the bezel off. It looks like they probably mounted it into a different vehicle. It still functions but I will have to design a different way to mount it. Pricey to get this stuff shipped in from Japan!